Outfit your goaltenders with first-class protective hockey goalie equipment. 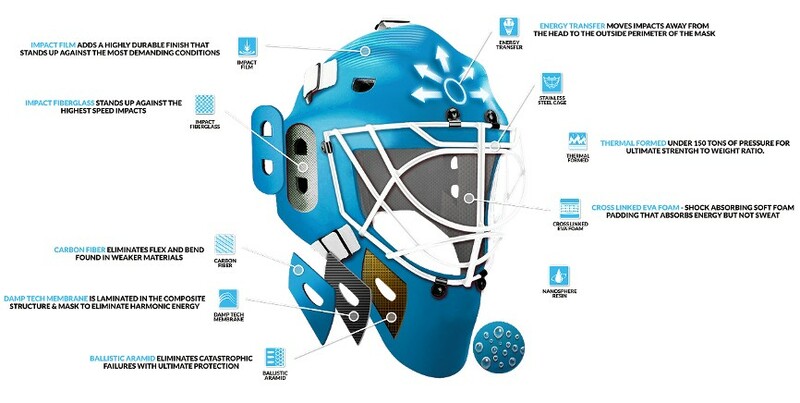 We have hockey goalie pad kits and masks. All Illinois orders are charged sales tax at the rate of 7.5%. The Wall Pro Active Goalie Mask was worn by Hannu Toivonen when he was playing for the Chicago Blackhawks. Hannu has worn the Wall Pro Active Goalie Mask at the highest level of play, and we are confident you will find all the comfort and protection you need in this product. 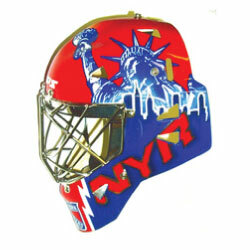 This mask has a unique design that eliminates uncomfortable ear ringing that is common in shots to the goalie mask. The HD 070 inner liner is different than any other liner in the goalie mask market today. It allows for a level of comfort and safety that gives a goalie a positive frame of mind when facing good shooters and out-of-control shooters that still shoot hard. The shell of this mask contains 25% rubber in the composite for increased impact absorption and shock dispersion away from the head. Both colors are $399 and have a $20.00 shipping charge. The Youth mask is $299 with a $20.00 shipping charge. Let us make the paint job on your goalie mask as unique as your goaltending style. Custom mask painting costs $350. Defender Goalie Masks founder Chad A. Warwick, brings over 20 years of experience in the goalie mask manufacturing business to Defender. When Chad started Defender in 2012 his mission was simple: Manufacture the most technically advanced goalie mask possible. The end result of Chad’s tireless work is a masterpiece where form truly meets function. Chad’s history in the goalie mask industry goes back to Port Huron Michigan and growing up watching his dad Gary Warwick make goalie masks for some of the best goalies in the NHL. Chad has fond memories of visiting Ed Belfour’s house in 1992 with his dad when Ed needed a new mask. Or the time Chad had to put a mask together while Dominic Hasek looked over his shoulder – ya that was stressful. It’s this rich history that drives Chad’s passion to take the family legacy to the next level in manufacturing technology and performance. When Chad began working with a leading supplier of composite materials, he knew immediately the goalie mask business was about to be reinvented. This journey culminated in 2017 with the fully realized Defender Double D.
Refurbishing is $250.00 and has a $20.00 shipping charge. This kit is $39.95 and has a $10.00 shipping charge. Good As Gould Goalie Schools will soon be manufacturing high-quality, custom goalie pads. Expert design and craftsmanship, as well as custom sizes and colors, will make Gould the obvious choice for all your equipment needs.